I'm originally from Finland and since childhood I've liked to draw and paint, so "art making" became my lifetime hobby. I got education in business and later also in public law, but my heart, it has always belonged to painting. When we moved to USA twenty-six years ago, I pursued my love of art, taking college courses in photography, graphic arts, drawing, and painting. In addition, I received private instruction from Sarah Williamson, Rita Allred, and Marilyn Fairchild, and I learned to do portraits. My style is impressionistic: most of the time I use quick, bold strokes. I work with strong, vivid, warm hues, frequently yellow, blue, and red mixtures. I like to capture the moment. Because I have been living in the south, I often paint tranquil southern landscapes. For example, I have painted cabins in the Blue Ridge Mountains and boats moored in the waters off the North Carolina and Georgia coasts. I have painted sandy beaches, country market scenes, southern homes, and gardens. I paint spring colors (azaleas, weeping willows) and fall foliage. My still life compositions contain clay pots, fruits, and flowers. I love people. I take the time to learn about the people I paint. I add details to bring out their feelings and emotion. With every brush stroke, I apply my mind and my heart, to convey a mood and a soul, so the painting becomes something more than a copy of a photograph or a sketch. From 1995 to 1998, I was a member of the Charlotte Artist Guild. In 2000, my paintings were featured in One Artist Show sponsored by Picture Perfect Gallery in Charlotte, North Carolina. In 2002, my works were displayed in another One Artist Show sponsored by BA Framer in Duluth, Georgia. That same year, I participated in a group show in Atlanta sponsored by Zero Gallery. 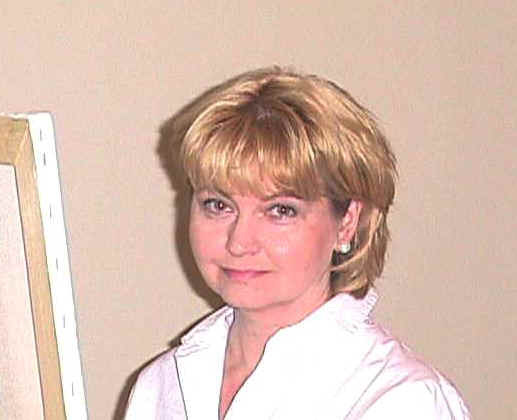 Since 2003 Art-O-Take has been my art-representative in Georgia and Florida area with numerous shows. 2004 I had a successful first show in Finland.